Strength and power expert, Prof Dr.Dr. Dietmar Schmidtbleicher has been invited for a 2-hour discussion regarding sports conditioning-related topics with a small group of strength and conditioning coaches in January 2016. For a record, the German scientist has published ~480 scientific journals and articles since the late 1970s when he started with his research studies. One of the topics we discussed was interference effects of concurrent training. Concurrent training is a structure of training combining endurance (aerobic) and strength training during a single training session. This structure is usually applied by coaches to reduce the number of training sessions that the athletes have to do in a week, as well as to obtain a certain mileage goal of running endurance for a particular week. Hence, they have athletes to perform aerobic endurance first and then followed by strength session with the conditioning coach. Despite these reasons, the structure may not be the best training arrangement according to Schmidtbleicher. One example of arrangement that has been used by coaches is to have athletes to perform endurance training such as long slow distance for 10km, and followed by weight training (e.g. 3 sets x 10 reps bench press) after some period of recovery (~20 mins). The first point that highlighted by Schmidtbleicher sounds like this, “neuromuscular condition is good if you’re not fatigue”. The neuromuscular system is certainly at best for performing many athletic movements during "fresh" condition. In contrary, it can be a problem for athletes to execute a sound technique of strength exercises when they are in a state of fatigue. Thus, Schmidtbeicher suggests the athletes perform running endurance and strength training, not at the same session. One reason for "splitting" the two types of training can be justified when we look at the “interference theory” which explains the “competing effects” occur at cellular level associated with performance of aerobic endurance and strength training simultaneously at the same session. The activation of enzymes (i.e. AMPK) important for the process of energy production (i.e. 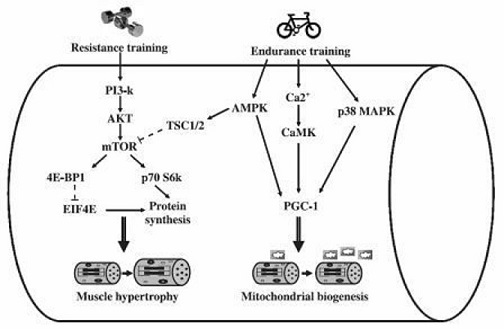 mitochondrial production) in aerobic endurance are not compatible, and in fact can possibly impedes the enzymes (mTORC1) that should be activated during strength training to regulate the protein synthesis (for cell growth). This “blocking” of the signaling pathways could minimize the adaptation of training. Threfore, athletes may not get an optimal benefit during concurrent training that is structured as above. Moreover, long-term performance of high volume or intensity of concurrent training may promote overreaching (while getting minimal training gain), which can possibly put athletes into the state of overtraining. Nevertheless, it is still important to scrutinize or make an in-depth inspection on this topic. We may want to look further at the dose-response relationship, specific objective (body composition et.? ), type of endurance training (running, walking, cycling, swimming? ), type of strength training (hypertrophy, strength, power), training structure for optimal training adaptation (lesser interference effect) while maintaining sports-specific requirement (for endurance-strength sports), and current research looking at these variables on the magnitude of interference effects from concurrent training. This allows one to ascertain if the aerobic endurance and strength training can be performed together at some degrees. From existing information (e.g. Wilson et al., 2012, JSCR), what we already know is that concurrent training can affect power production. If one has to do concurrent training, he/she must choose endurance modality that specific to his/her sports in order to avoid the occurrence of competing adaptations. For sports requiring strength and power, it is suggested to perform endurance activity at a higher intensity (e.g. 10 x 100m @ ~70%), rather than the 20-40 mins of a slow jog.